As the outdoor growing season comes to a glorious, but certain end — at least for our humble outdoor garden — thoughts turn to how to keep the summer alive throughout the rest of the year. In our garden, we grew hot peppers that weren’t hot, green zebra tomatoes that never materialized, lettuce that provided just a couple of small salads, and collection of herbs that’s been picking up the slack. All summer and still we’ve been treated with loads of chives, basil, mint, thyme, parsley, dill, and tarragon. Here’re a few ways to make the most of these as the summer slips away. And consider these applications for any fresh herbs you’ve got, whether you grew them or not. This is by far the easiest way to save and store any leftover herbs. It’s always the truest way to retain the true flavor of the herbs. I’ve tried and seen a number of techniques for drying fresh herbs — hanging bunches upside down, using a fan, a dehydrator, or even the microwave. By far the simplest and least messy is using egg cartons. I always seem to have a spare laying around for recycling. Just throw your herbs inside, close the top, and leave out for about a week. 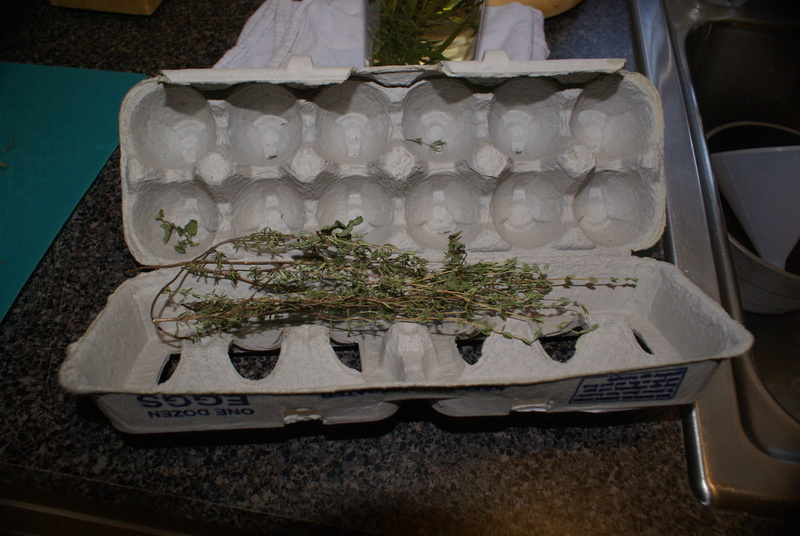 Once the leaves are dry, I remove the herbs from their stems over a flexible cutting board. Then put the dried leaves into a jar for storage. I got this idea from a unbelievably epic meal I had at Blue Hill at Stone Barns. One of the many seasonal and local courses that came out of the kitchen that night was a simple basket of bread with butter and two small ramekins of tomato and mushroom salts. They had dehydrated the tomatoes and mushrooms and pulverized them into powders which they mixed in with salt. The result was a flavorful addition to the breads, tasting unmistakably of mushroom and tomato. 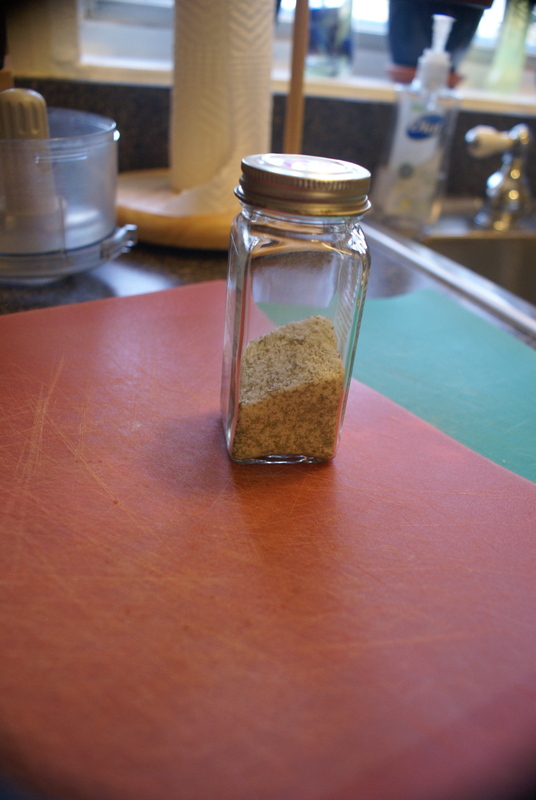 In an attempt to recreate this, I took some dried thyme (using the technique above) and combined with kosher salt, using one part herb, two parts salt, and ran this mixture through a mini-chopper. I also plan on using this same technique with mint and sugar. You don’t have to dry your herbs for this one. And the variations are pretty endless. 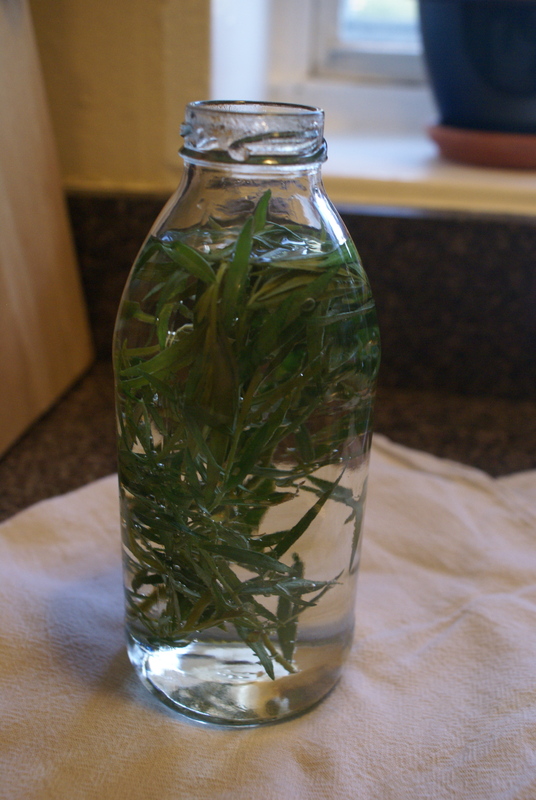 Given I’ve got an abundance of tarragon (an herb I’ve not usually had much luck cultivating) and an inclination to use tarragon in a variety of salads, I opted to make an tarragon-infused vinegar. Stick with a light vinegar in order to appreciate the herbal flavor you’ll infuse — rice, white, champagne vinegars are all good choices. Stronger flavored vinegars like balsamic and sherry will overpower any subtlety the herbs might impart. Dead simple. Heat your vinegar (enough to fill whatever vessel you’re going to store the vinegar in,) stuff the herbs in said vessel, and pour the warmed vinegar into the bottle. Let the liquid cool down before screwing on the lid. 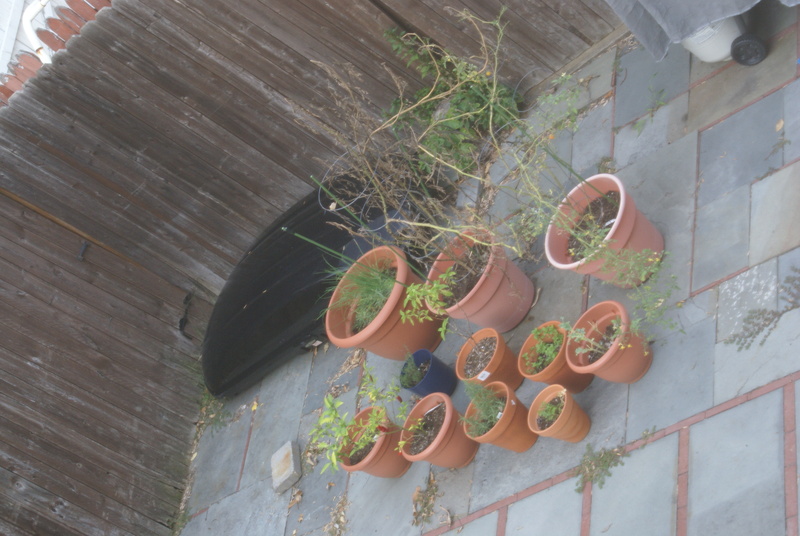 After a week you can fish out the herbs, or you can just leave them in. Use your vinegar as a dressing by itself or as part of a vinaigrette. Or use to brine pickles. A tarragon vinegar would make a great basis for a cornichon recipe. Just about the same procedure as for vinegar. I went with rosemary, chive, and basil oils. 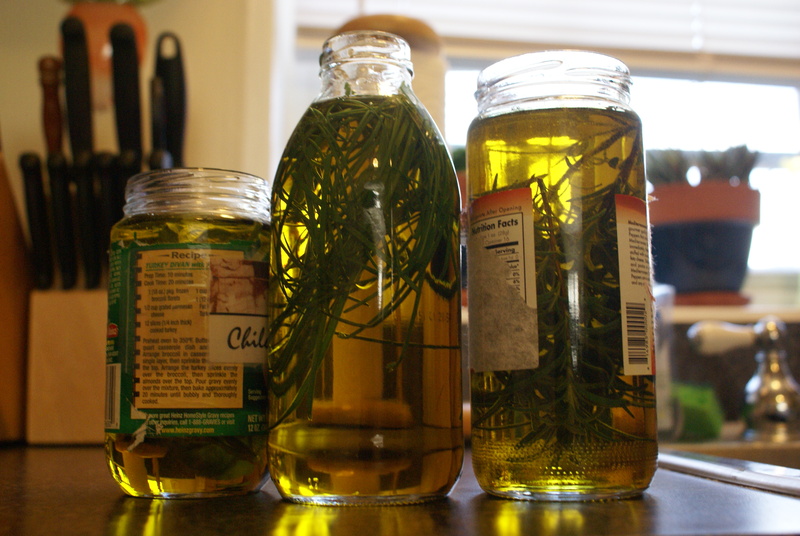 I plan on using the rosemary oil for dressing and seasoning meats for roasting or grilling, while I’ll use the chive and basil oils for seasoning vegetables. And any of these would be great on a pizza or bread dough or for popping popcorn. Got any other grand ideas for that bountiful harvest of herbs? Let me know.